The Jack & Jill Children’s Foundation is asking people to liberate their unwanted Lego bricks and to donate it to the charity to fund home nursing care and respite for families all over the country who are caring for their sick child at home. And we want to say a big thank to DPD Ireland, Topaz and our charity shops for setting up Lego collection points nationwide and to our media partners DDFH&B, Mindshare, Today FM, Screen Scene and Orlaith Rafter who are helping us spread the word about Lego donations. 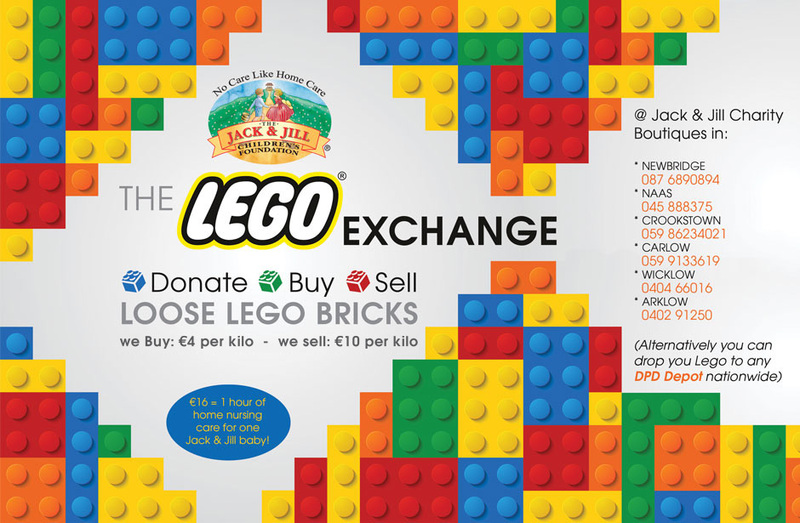 There is an option to sell the Lego via the Jack & Jill shops for €4 per kilo, but we’d obviously prefer donations if possible. Please help us spread the word by alerting your family and friends to the Lego drop off points for Jack & Jill and if you are doing a fundraiser for Jack & Jill why not ask people to bring their Lego along and you can become our additional collection points. We’re really hoping that more schools, preschools, clubs and businesses will jump on board the Lego express for Jack & Jill. Every €16 raised through this Lego appeal will gift one hour of home nursing care for a sick child suffering from severe development delay as a result of brain damage, who typically can’t walk or talk, who may be oxygen dependent, tube fed and on very heavy medication. Underneath all of the disability, however, these precious children under Jack & Jill’s wing do better at home and that is where their family, friends and community want them.